The Avengers crumbled to dust as viewers watched the Mad Titan Thanos’s plan of genocide unravel. Jump back to the United States and S.H.E.I.L. D agent Maria Hill (Cobie Smulders) and S.H.E.I.L. D director Nick Fury (Samuel L.Jackson) meet the same fate. However, when Fury fades away he drops a galactic-looking pager to the ground that reveals the symbols of Captain Marvel (Brie Larson). Since this end-credits scene in Avengers: Infinity War, alongside the announcement and following trailers of Captain Marvel, fans everywhere are begging the question – What is Captain Marvel’s role in reversing Thanos’s Infinity Stone-powered snap of death that wiped out 50 percent of all living creatures? Well, for now, fans can only theorize about Captain Marvel’s involvement in Avengers: Endgame. The extremely powerful Kree-trained hero has yet to make an appearance in an Endgame trailer. Many think this is because writers of the Marvel Cinematic Universe (MCU) want viewers to see Captain Marvel in her standalone film first, coming in March of this year —just a little over a month before the late April release of Endgame. 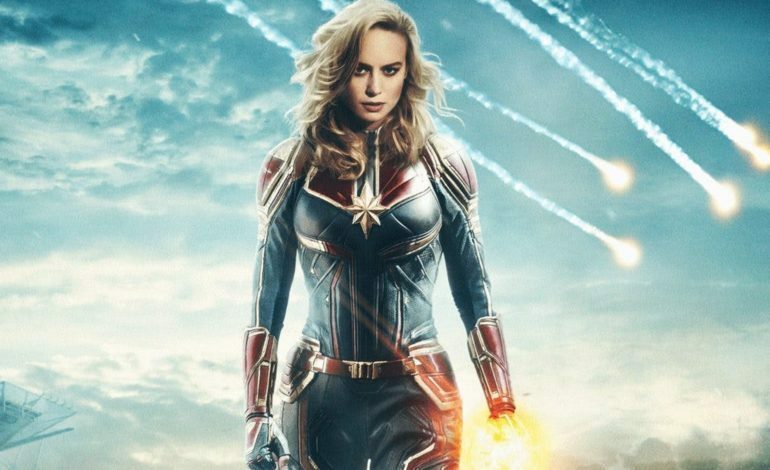 With elevated hype for her role in the Endgame as well as her prequel film, Captain Marvel seems to be a reoccurring subject of conversation in the MCU. According to renowned Marvel producer Kevin Feige, the hype surrounding the human/Kree hybrid hero. Feige said Captain Marvel will be at the forefront of the second phase Avengers (Black Panther, Scarlet Witch, Spider-Man, etc.). This obviously ignited the already weaving tapestry of collected fan theories about Captain Marvel. But now, fans are beginning to look beyond the first phase Avengers and into the future. How can a newcomer like Carol Danvers aka Captain Marvel be at the forefront of the new wave of Avengers? Here are 3 fan theories for Captain Marvel’s role in the MCU in the years to come. Captain Marvel will reveal the long and violent history between the alien races Skrull and Kree. The Kree, as shown in Captain Marvel’s heightened abilities that include flight and incredible strength, as well as Guardian of the Galaxy’s Ronan the Accuser (Lee Pace), are a dominant force of fierce galactic warriors. But, the Skrull should not be underestimated. The Captain Marvel revealed the Skrull’s most tactful power when Danvers (Larson) punches a Skrull that shapeshifted into an old woman. Shapeshifting creates an obvious issue for Captain Marvel and possibly even our Avengers in the past. Fans have created multiple theories about major characters who could actually be Skrull agents in disguise. One of the being Clint Barton aka Hawkeye (Jeremy Renner). After his long absence following Captain America: Civil War, Barton made a shocking appearance in the Endgame trailer. He is shown violently, and seemingly with rage, attacking a group of men on the street. Black Widow (Scarlett Johansson) appears to be afraid of Barton in this scene. It isn’t clear if Hawkeye recognizes his old Budapest partner, but something in him has clearly shifted. Maybe even shapeshifted? Another theory says that it is S.H.E.I.L.D. director Nick Fury (Jackson) who is a disguised Kree agent. This would make sense if the Skrull were looking to obtain information about the counter-terrorism organization. It has been noted in both interviews with the cast of Captain Marvel and shown in the trailer that Fury and Danvers develop a relationship and work together amidst the alien war. Therefore, if a Skrull posed as Fury, they would be able to obtain confidential information about both S.H.I.E.L.D and Captain Marvel herself. If that is the case and Fury is truly dead via Thanos’ snap or even sooner, this could set the stage for an all-new director of the law-enforcement agency, possibly Black Widow? Or maybe Maria Hill (Smulders)? A third theory suggests that Captain America (Chris Evans) is a Skrull agent in disguise and has been ever since Civil War. The theory accuses Cap of masking his rogue actions and alliance with accused terrorist and friend Bucky aka the Winter Soldier (Sebastian Stan) as compassion for an old war buddy but was actually a Skrull attempt to divide the Avengers. Either way, if the future film’s reveal a disguised Skrull agent, the team will undoubtedly need a Skrull expert. Enter Captain Marvel. Marvel comic book fans were more than likely taken back by the dominant presence Vormir had in Infinity War. The location of the Soul Stone wasn’t hinted at the way the other infinity stones were throughout past Marvel films. It has sort of been the out-of-left-field stone, until now. In the last Avengers film, Gamora and Thanos travel to Vormir to obtain the Soul Stone. Thanos sacrifices a soul for a soul, murdering the only thing he’s ever truly loved, Gamora (Zoe Saldana). While this whole scene had viewers focused on the resurgence of thought to be the long-gone Captain America villain, Red Skull (Hugo Weaving and Ross Marquand) and then Gamora’s dramatic fall to her death, Vormir itself hinted a connection to the future front(wo)man of the MCU, Captain Marvel. Vormir is said to be in Kree space in the Large Magellanic Cloud — which is extremely relevant to Captain Marvel. Given that this is just speculation, the connection of Vormir to both Captain Marvel seems to urge the idea that maybe the galactic space hero can restore the Soul Stone and maybe even save Gamora, restoring a leading member to the Guardians of the Galaxy lineup and a possible key in Thanos’ eventual defeat. Time travel is a widely assumed component of the upcoming film Endgame and plenty of sound evidence has circulated around the MCU. Samuel L. Jackson (Nick Fury) revealed in a recent interview that Captain Marvel can time travel herself — not an ability she had in the comic books. It is possible that when Jackson said Larson’s character is one of the only characters in the universe who can time travel, he meant her unique race of both human and Kree gave her capable characteristics to accomplish the feat. This is most likely why Fury paged Captain Marvel before her became personally victimized by Thanos’s obtainment of the collected infinity stones. Scott Lang, or Ant-Man (Paul Rudd), is another MCU character suspected of time-traveling capabilities. Lang subconsciously traveled back to Hope’s (aka the Wasp, Evangeline Lily) childhood memory of playing hide-and-go-seek with her mother in Ant-Man and the Wasp. The film credited this connection to Janet Van Dyne (Michelle Pfeifer) being trapped in the Quantum realm for decades. While that may be true, it is possible that Ant-Man could time travel using the Quantum Realm, possibly setting the stage for a team-up with Captain Marvel to reverse Thanos’s snap of death. Fans should note that Brie Larson has signed a seven-movie contract with MCU. Captain Marvel and Endgame are only the first two. Therefore, it’s safe for MCU fans to assume that the galactic-warrior-hero has plenty of power and space intelligence to bestow, regardless of how Marvel’s writers decide to connect her to the second phase Avengers.